Click on the link below to read Mrs. Klin's 6th Grade Social Studies Class Local History Project iBooks. April 2017, Jan Hill and Paul Penna renew rolling lease for 100 Main St. 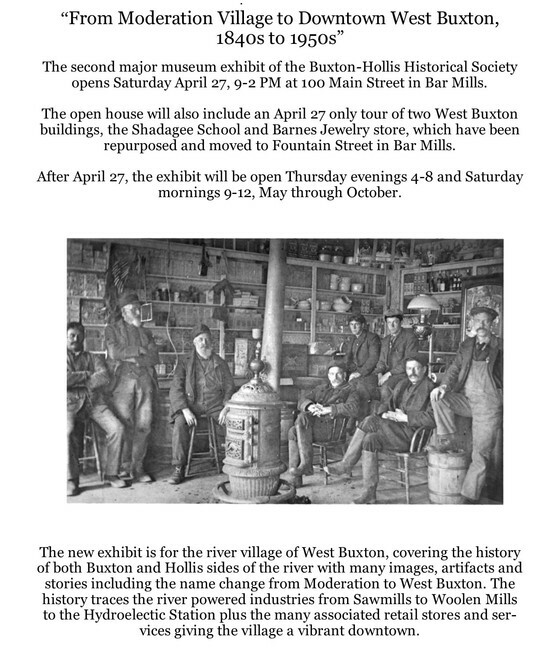 Organized and incorporated in 1970, the Buxton-Hollis Historical Society is a 501(c)(3) non-profit organization with partial support from the towns of Buxton and Hollis, Maine. The society’s purpose is to collect, preserve and publish whatever may be related to the early and late history of the towns of Buxton and Hollis, including but not limited to books, relics and articles about early settlers, records of colonial and later wars, as well as genealogical information and maps. Our Society's museum, library and archival collections include a wide range of materials documenting the rich heritage of this area of southern Maine and the Saco River Valley. 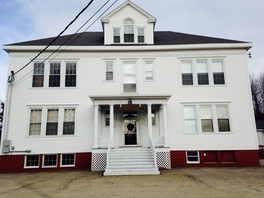 The N. C. Watson School Museum at Buxton Center offers third grade classes and other visitors the opportunity to experience life in a one-room school at the beginning of the twentieth century. Throughout the year, the Buxton-Hollis Historical Society provides lectures, cemetery and house tours, special exhibits, books and items of historic interest and educational activities for people of all ages. All of our meetings are open to the public and membership is open to all who wish to help. Our facilities include the Library, Museum and History Center and Museum at 100 Main St, Bar Mills, the N. C. Watson One-Room School at Buxton Center, and the historic 1802 Elden Store at Buxton Center. We invite your support by becoming a member of the Society! See an excerpt from the "Buxton, Maine - An American Story" documentary. Note this entire video is available on DVD and can be purchased from our Museum Store.